Did you make construction paper turkeys and buckled hats in elementary school? I know I did. We elementary school-ers dug our scissors into orange, red, brown, yellow to create Thanksgiving art. And then we looked at pretty framed pictures that have become American icons of gratitude. These pleasant scenes may trick us into thinking the world was a more peaceful place than it is now. However, the celebration has often been shadowed by discord and world war. * The pilgrims fled religious persecution to find freedom in the new world. Though the scene above looks peaceful and full of plenty in 1621, many immigrants did not survive the winter. * President Franklin D. Roosevelt, just weeks after the attack on Pearl Harbor plunged the US into World War II, signed a congressional bill in December 26, 1941 moving the date for Thanksgiving to the fourth Thursday in November. FDR was criticized for being too idealistic in his State of the Union address of January when he outlined his idea of the Four Freedoms: Freedom from Fear, Freedom of Worship, Freedom of Speech, and Freedom from Want. Take another look at this painting. Three generations circle the table, the all-white nuclear family considered the ideal in 1943. As Bob Duggan points out in his article for Thanksgiving 2013, if Rockwell were painting in this decade, surely the skin color would be more racially diverse. And, instead of a gathering of biologically-linked people, family may extend to include friends and neighbors of many creeds. What is the Young Man Asking? See the young man looking out of the setting to you, the viewer? His smiling eyes may be asking you to join and share the bounty spread out on the table – lots of protein, plenty of vegetables, and pumpkin pie, no doubt. But is that all he is asking? Perhaps he is inviting you as onlooker (and possible guest) to participate in another kind of freedom: to free one another from all kinds of want beyond the physical — emotional, social, and even spiritual. No doubt you are looking forward to a Thanksgiving gathering, either at your house or somewhere else. How can you help others to have something to be thankful for, finding a way to include sharing in your practice of thanksgiving? That’s one way to smile back at the young man at the table. Quote contributed by my friend Jenn, a Canadian blogger, who reminded me that Canadians celebrate Thanksgiving in October. Happy (belated) Thanksgiving greetings to all. Good morning, Marian. There is so much to comment on here, so I’ll limit myself. 🙂 By 1943, the US had entered WWII, so I think “fight” can also be taken literally here, and this white, multi-generational family was an ideal in another way–in many families the young men would be at war, and some of the women might also be absent, as nurses, or in war-related work. The country was also emerging from the Great Depression, so want was also something many had experienced. 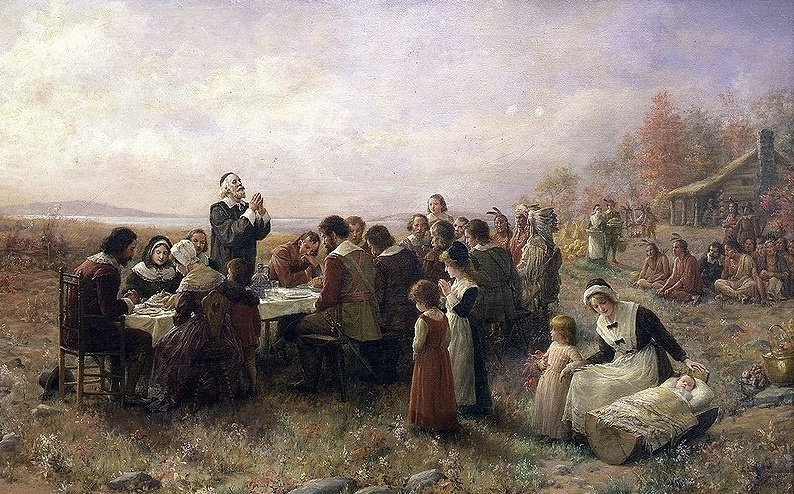 As far as Thanksgiving, there were many thanksgiving observances before it became an official holiday. (And just as an aside, the Pilgrims and others seeking religious freedom were not necessarily tolerant themselves.) Sarah Josepha Hale was instrumental in getting Lincoln to recognize the holiday. Thanksgiving this year will be strange, and it could be tense. I know many families are feeling a divide. I’m hoping for more family love and food–and our “famous” 🙂 cranberry squirrel. Thank you for providing the historian’s bold voice to begin the conversation here. Rockwell’s painted a scene so serene and idealistic it’s easy to imagine the world was peaceful then. I know we’ll see your own family’s celebration on your blog next week. You are so fortunate to have your loved ones living so close by. This year especially, with so much turmoil, we all need to spend Thanksgiving thanking God we live in a free country. Yes, Jill, after all the fallout from the recent election, we tend to forget to celebrate our freedom – and there are certainly more than four as Rockwell pictured them. Happy Thanksgiving to you too, Jill! The preamble or headline on the art, “Ours to fight for” likely wouldn’t have been appreciated by most “plain” folks including my parents. So conflict was and is definitely part of our country’s history from the get go, unfortunately. 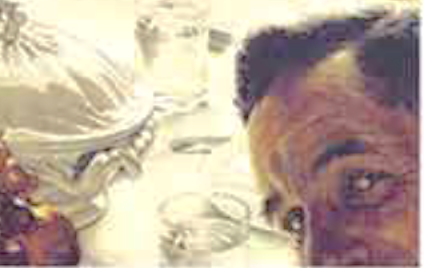 I don’t know that I ever paid much attention to the guy at the end of the table looking at us: it certainly could be Rockwell himself, as various painters included themselves in their paintings (didn’t they?–you’re more artsy than me) but seems like I remember that practice. I like it because his warm and almost winking smile reaches across the years to say … “yes, so fortunate.” I would say Thanksgiving is the favorite holiday of all my children. Yes, Thanksgiving is my favorite holiday too. It seems to be less tainted by commercialism than most other holidays and it’s centered around the holy sentiment of gratitude. Yes, you are right, it was a Renaissance tradition for the painter to “hide” himself in his work, Michelangelo in The Last Judgment a prime example. Freedom from personal possessions is a big one with me. We work so hard to accumulate wealth and creature comforts, but how much do we really need to be truly happy? Less is more, I believe. We don’t celebrate Thanksgiving in Europe, but I am thankful for all the kind people I’ve met over the years and for those who stuck by me when times were hard. Happy Thanksfiving to you and your family, Marian. Thank you for the good wishes, Fatima. I am thankful for your friendship through the blogosphere as well. Your gravatar photo also proclaims the message “less is more” as you carry your house with you so to speak, certainly an economical way to live and travel. I always enjoy seeing how you combine artifacts around the holidays, Marian. We were subscribers to the Saturday Evening Post when I was growing up. I loved looking at the Norman Rockwell covers, although this one was before my time. This Thanksgiving will be a special time this year because our whole family will gather in Virginia. We have been separated more than usual, and we will be truly grateful to be reunited this year. I like Melodie’s idea about the young man. Maybe Rockwell was immortalizing himself and pointing out the role of the artist in looking at any scene. The narrow face and perceptive eyes could suggest a Rockwell self-portrait. I like that idea! I know you are enjoying your fellowship in Collegeville, but separation from family especially during these tumultuous times must be especially difficult. You and your family will have a lot of catching up to do: I can imagine you and Stuart comparing your Cuban experience. Thank you for adding to the flavor of this post with the William Ward quotation. Yes, I will enjoy some pumpkin pie. Do Canadians have a “set” menu as many Americans do – turkey being a menu staple? In fourth grade, my Sunday school teacher–a retired cello and flute teacher from many years earlier–played both on the Sunday before Thanksgiving. She had given us child-size instruments to accompany the lessons of her story about Thanksgiving. She talked about all the dangers, disappointments and deaths surrounding the first Thanksgiving, and say the real lesson was to be thankful–and hopeful–for what we had and how God would help us make the most of it. I still remember the lesson, and Rockwell’s art conveys it well. Happy Thanksgiving to you and yours, dear Marian. Your anecdote reminds me that the cello is the stringed instrument closest in timbre to the human voice, a voice that still resonates with the memory of your S. S. teacher. Wonderful story – thanks for sharing it here for others to read, Marylin. Marian — Like you and some of the other readers, Thanksgiving is my favorite holiday, too. But rather than looking forward to a single day set aside per calendar year, it’s my practice to observe every day as a day to give thanks. In our home we start each day with intentional appreciation. It can be thoughts of gratitude for a person, place, thing, event, or opportunity. The options are limitless, as are the benefits (body, mind, and spirit) of gratitude. People are yearning for a positive note among shrill voices we’ve heard lately. You and Len start the day sending out good energy, much like I (and others) practice with a gratitude journal. Thanks for the comment here and the Twitter share too, just like you, Laurie. Marian, thank you for this historical perspective on Thanksgiving, a holiday that doesn’t get the attention it deserves. It is especially important in the aftermath of this election that we do pause to give thanks for our many blessings-not the least of which is a free country. I’ll be blogging about it on Monday. I always feel so enlightened when I read your posts.😊Wishing you and yours a Happy Thanksgiving! This has been a rather rocky year for both of us, yet we have so very many blessings, including more than four freedoms. I count mine daily as do you. I look forward to your Monday post, Kathy. Thanks for the greetings here and for the Twitter share. Finally got to your post an d once again it has helped me. I have been so broken since this election because many of my clients are fearful and feeling helpless. I was happy that our mayor in Chicago reiterated that it is a refuge for the immigrants. I can’t see people suffer or be afraid. I know God is control. It’s easy for me to know yet hard for the person being in fear and not know God to understand. This is a time that many will have to look to God for strength. Thanksgiving is my favorite holiday and I think I’m probably the only Spanish person who prepares the all American Thanksgiving dinner with Mom Longeneckers cranberry sauce. It’s the only day nothing Spanish and my family loves it. I always liked Saturday Evening Post. We were taught that the American Anglo families were what we should grow up to be like because of their values. I have been blessed to have both and I embrace both cultures and remind my children and grandchildren of our great blessings. May you and your family have a blessed day. When our son moved to Chicago to pursue graduate studies, he and his wife lived in the Mexican community of Pilsen, a neighborhood they loved. I remember his photos of the festive parades there. It’s music to my ears that the mayor of Chicago is reassuring people that they don’t need to fear deportation – ugh! I smiled when I read about Having my mother’s cranberry sauce for Thanksgiving. A few years ago I published her recipe on one of my blog posts. When I listen to songs I adored way back and I’m singing along to them I stop in my tracks and say. ‘ Did I really just sing THAT ‘ 😂😂😂 …yup times change . All we can do is smile , what else can we do . That crystal ball could use a little polishing right now, don’t you think. This week my husband and I enjoyed viewing a new Netflix TV series “The Queen.” I have no idea whether it is available where your live or not – possibly originated with the BBC. The series shed some light on the personality of Queen Elizabeth and her family including Margaret Rose in the years from the 1930s – 1960s. I predict it will win more awards for the characterizations and the set. It slows down history, some of which I remember from newspaper stories in the 1950s and 60s, and dramatizes the fearsome duties of the monarchy. My Grandma used to say, “Heavy hangs the head that wears the crown.” A few days ago, I put one of my 5-pound barbells on my head to feel the weight – wow, that’s heavy. You seem to be a happy soul – singing old timey songs that lift your spirits. Your little emojis are cute, Cherry. Thank you! The crystal ball certainly could do with a bit of polishing . Yes I have seen the series advertised. I must watch it . I feel privileged to have a royal family: it’s something we never take for granted …all that history but like you say it comes with heavy weights . The only royal member I have met is Princess Diana …so sad , she’d be so proud of her lovely boys and grandchildren now of course . I admired Princess Diana too and wish her life story had matched her love for her family, especially her boys. I believe her granddaughter bears her name: Charlotte Diana . . . . Yes, my heart breaks too for oppressed peoples, especially the Syrians. All good wishes to you Marian and your family for Thanksgiving and to all Americans who honour this special day of giving thanks for those four freedoms and who extend their gratitude to those less fortunate. We don’t have such a day in SA though we most certainly know of it. My husband’s sister lives in San Fran (last 55 years or so) so we get to hear of and see photos of their family and grandchildren. Happy Day! I’m always happy to see you here knowing the world is still turning – now I in mid-day and you deep into the night. I think there are other parallels to be drawn here, perhaps of the yin-yang variety, noting that light carries the seeds of darkness and vice versa. But I digress . . . . I am most grateful for our online friendship in this special season, Susan. Thank you for your good wishes here. So like you – and, an appropriate counterpoint to the table talk! You live life with gratitude, Debby. I imagine you celebrated the occasion with other Canadians in October. Happy weekend to you and hubby! I have to say I’m conflicted about Thanksgiving… not being American, it sometimes seems as if the immigrants (i.e. Americans) eradicated the native Americans who were there first? The best way to be thankful is to concentrate on what you have rather than what you don’t have. You do have a valid point. Last evening I saw a documentary about the Pilgrims, and according to that, their celebration was about thanking God for making the voyage safely across wide waters to the new land. Nevertheless, I agree, the native Americans do not usually get their due, except as “props” in some depictions of the occasion. Thanks for the comment here, Fiona. 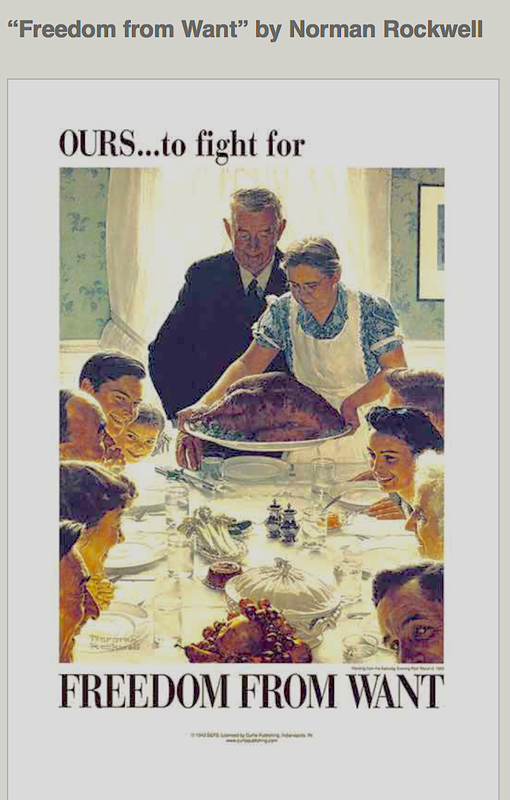 I love Norman Rockwell’s pictures and Thanksgiving is one of my favorite holidays. But today the pictures need to be a bit more international! Actually quite a bit more… I think I love Thanksgiving Day because it’s such a family holiday. Weather providing, we’ll have some family joining us! I can’t wait!!! Thanks for sharing this reminder of what Thanksgiving Day is really all about! I agree – there’s not much commercialization of Thanksgiving, and I like it that way. In fact, not much disagreement about the menu either – for us anyway. It’s the same every year. With five grown children, I imagine the number around your table keeps growing. It’s nice to see you here again, Anita. Thanks for stopping by with a comment. Happy Thanksgiving to you and yours! What a delight! Those smiling eyes make me I feel invited to the bounty. Oh, those Saturday Evening Post covers of my childhood that told me about the world outside my family but only occasionally helped me question the vision presented. Thanksgiving was once my favorite holiday, at my Grandma’s as a kid (a little like the Norman Rockwell vision) or the many years my meditation center held big dish to pass vegetarian dinners. There might be 100 people there with lots of children and amazing food and community. As the kids grew up, people went back to smaller gatherings focused on nuclear family. My CA son is arriving today but leaves on Tuesday because of flight costs closer to Thanksgiving. My NC son spends this holiday with his wife’s family. I’m invited, but decided to stay home. I have Vic’s mom who was briefly in the hospital this week (more about that coming in my blog), but she wants turkey, cranberry sauce, pumpkin pie, and the rest, so she’ll have Thanksgiving dinner at her residence. I’ll spend Thanksgiving with friends–a vegan from Canada and another from Latin America. Instead of turkey, there will be black bean burgers with tomato sauce from my summer bounty–and plenty of winter squash. You always leave a personal stamp here – sometimes a nostalgic bit, other times an event you are looking forward to. Here you’ve done both. Making holiday plans with grown children is quite a dance. My son often caters to his wife who has two families to please (her dad’s and her mom’s, separate entities). They agreed that maybe they can spend next Thanksgiving at our daughter’s house, who has taken over the reins of hostess for the extended family now with no complaints from me.